Lauren Kellegher plays Poppy Munday in this double-disc audio drama from Bafflegab (formerly Cosmic Hobo). She is a fangirl of glam rocker Vince Cosmos; the year is 1972. Released as an "album" of song titles, this ingenious tale revolves around the mystery of dwarf Mr Glister, who is living upstairs from Poppy and flatmate Trish, and the "assassination" of Vince during a concert. My first "delight", other than Kellegher herself, was the introduction of Katy Manning as dotty landlady Gilda Fairbanks - her charm and warmth shining through in every scene. Poppy chooses to spend her days listening to Vince Cosmos LPs whilst clearly avoiding any kind of job search. The first half of the tale is fairly slow but not uninteresting; Kellegher's narration (joined by the endearing qualities that Manning touches upon throughout) keeps the spirits high and eager as the story progresses. As a debut, it is a safe choice to play it steady, whilst introducing the characters and setting everything in place for what is to come in both the second half of this play, and follow-up titles. The music is wonderfully achieved here, embracing early 1970s glam rock with style - following this album with songs from T. Rex, David Bowie, Sweet, and Roxy Music is highly recommended! 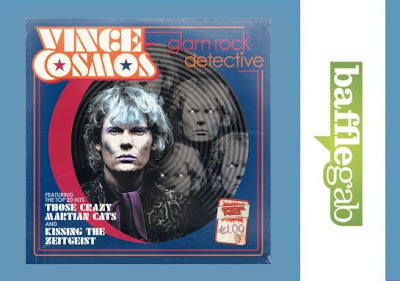 Julian Rhind-Tutt as the charismatic Cosmos is a perfect choice, the rocker so charismatic, compelling and narcissistic. But then, he is here on a mission - or so he claims! What surprises me is the amount of style that has been put into the whole package, including a sleeve that promises a double disc of music with tracks such as "Intergalactic Visas", "Kinema Karma", "Those Crazy Martian Cats", and "Stellar Benedictions", along with the message, "This is the first full album of new songs by the already-legendary space icon Vince Cosmos! Take it home, glam yourselves up, and turn it on full blast, kiddos. The Saviour of the Solar System has come to teach you how to play!" Though Julian Rhind-Tutt (Green Wing) is the big star, the debut of Vince Cosmos belongs to Lauren Kellegher; this is her journey, and I feel privileged to have shared it with the young actress! And, as one story ends, I am awaiting the next adventure with an excitement I haven't felt since first hearing The Scarifyers, also a Bafflegab production. At this point, mention must also be given to Simon Barnard for producing and directing this heart-warming tale; Edwin Sykes for the music, performed by Chance; Paul Morris for his out-of-this-world lyrics; and the cast and crew in general, for a production that is filled with fun and humour, glam, and enough glitter to fill the London Palladium.